Notes: Mid-morning on a Wednesday seemes to be the right time to visit this independent lounge…simply titled “The Lounge”. (I’m a sucker for simplicity). Crowds were light as there were no flights serving member airlines (Air India, Eurofly, Avianca to name a few) at the time. Wi-Fi & Workstations: Wi-fi is complimentary and a few internet workstations are available. These are not full workstations, however. There are a few tables that might suit the purpose, but are not as practical or useful as a standard cube. Service/Food & Drink: The front desk attendant seemed to be running the show. Upon checking us in, she took our order for the continental breakfast offering. Juices, soda, beer, coffee and tea were self-serve. The bar is also self-serve and includes wine, spirits and mixers. 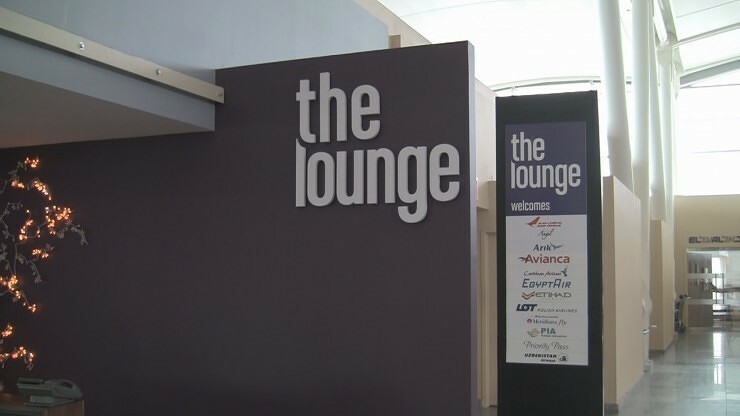 Convenience to gate: This lounge is landside, meaning you’ll still need to clear security before proceeding to gate. Otherwise, you’re right above the entrance to the “B” gates in Terminal 4.